Why enable client cache ? Client cache is simply RAM cache for client PC which used client's RAM to cache read/write data. When the client cache gets full, it will be flushed to the server as writeback data to the writeback disk. This way, client cache provides better performance for the diskless client and also reduce the load on server writeback disk. 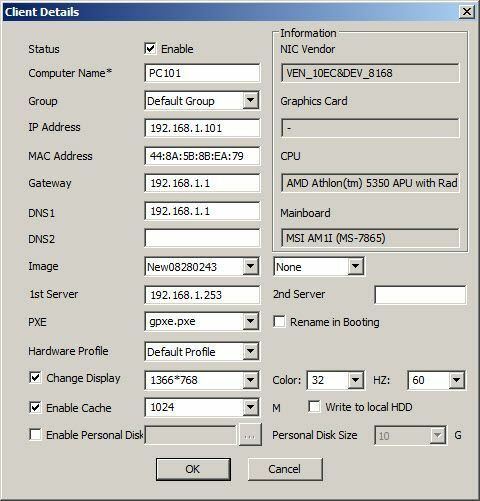 1) On CCBoot server, select the client PC, right click and choose "Edit Client" to open the window as below (Figure 1‑1). 2) Tick the checkbox at the front of "Enable Cache". You can either select using the drop down menu or enter value manually. Please refer to the following table. Note: In new version of CCBoot, you can set Client local cache to auto, this will automatically set the local cache based on the amount of RAM available. This also give you a slight boost in boot speed as well as client performance. Note: If you have more than 16GB RAM in client then you can set 2048 MB or set it to auto. Any lower, do not use auto in Client Cache. 3) If you tick the "Write to local HDD" the the client will not use the RAM for cache but will use the local hard disk for writeback. Note: You need to have a local harddisk already formatted. If not local writeback will not work. 4) Click "OK" to save the settings. a) Reduce the size of client cache size, if it is still failed, try method b.
b) Reinstall CCBoot Client with selected "Start Cache After Login Window". c) Disable the client cache. d) Update CCBoot client to same version as CCBoot server. If the client OS is 32bit, then the unmanaged RAM can be used as client write cache. For details, please refer to "Unmanaged RAM as Client Write Cache". Note: if you are using third party DHCP like pfsense then please follow the wiki to setup pfsense properly or the client cache will not function as desired.